Although most of these topics had been covered in previous Federalists, this is the last time he discusses challenges facing the Articles before moving on to the benefits provided by the Constitution. Federalist #22 does not break any political philosophy ground like the others might, but it does create a nice transition to the next ‘chapter’ of Papers. In Federalist #22 Alexander Hamilton continues to elaborate on the problems he sees in the Articles of Confederation. Hamilton does this by assessing five main points: regulation of commerce, military power, voting rights, court system and ratification. It is important to note that Pennsylvania became the second State to ratify the Constitution two days before this article’s publication. Although Hamilton undoubtedly would have known this (and it would have boosted his confidence in the Constitution’s success), it most likely had no effect on this Paper as the content surely was written already. Perhaps the most important issue with the Articles of Confederation was its inability to regulate commerce. This fault had several points in itself, but most notably it was affecting the signing of treaties with other nations. Foreign countries had grown hesitant to trade with the United States as the individual States often violated treaties with no repercussions. Other nations were forced to treat with the States separately, which led to confusion and breaks in the agreements. Hamilton goes on to demonstrate the Military problems with the Articles by referencing the Continental Army. With the Revolutionary War still fresh in the minds of his contemporaries, Alexander reminds everyone of the difficulties recruiting soldiers for the common defense. Since the States raised their own Militias at the same time as the Continental Congress, they were competing for the same soldiers. This started a bidding war (or as Hamilton called it ‘an auction for me’) and drove up the cost of troops. If the need for defense arose, this competition could slow the call to arms and leave the United States exposed to an enemy power. Hamilton went on to complain that, under the Articles, the seven smallest States could control the Government. These States combined for only one third of the total population of the young nation. Not only was this unfair, but the people of the larger States would eventually grow sick of the situation and overthrow the government…by force if necessary. Alexander then discusses the need for a Supreme Court. The highest Justices in the individual States could interpret the same Confederation Congress laws differently and, therefore, a Supreme Court was needed to make these clarifications. Finally, Hamilton basically declares the Articles of Confederation null and void because it was ratified by the State Assemblies and not the people. As the people should be the true source of power (in his opinion at least) the Articles were never properly installed as the nation’s government. As the military and commerce arguments have been presented before, we will skip the Anti-Federalist Stance on those for now. As for the voting, Anti-Federalists would mostly agree that there needed to be some reform to the unfair balance given to less populated States. They would disagree over the need for a Supreme Court and the invalidity of the Article’s ratification. Obviously, those who did not want to place power in a Federal Government would also be against ceding the ability to decide laws to an overriding Supreme Court. This is especially true if there was no National Government to control said Court. When it comes to ratification, well, as I said before…declaring the ratification of the Articles incomplete is a strange statement and most Anti-Federalists would not have taken the time to argue it. Do you want to read about this interesting time in American History? You might like the article I wrote back in September about the Ratification of the Constitution. 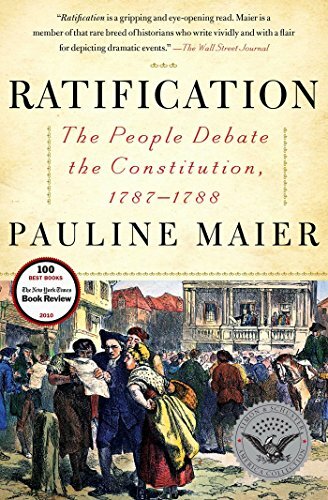 Want to read even more about the ratification process? This book dives into this incredible time in the Founding Period. Pick up a copy through the Amazon affiliate link below (you’ll support this site, but don’t worry, Amazon pays me while your price stays the same).